Thanks to the good work of the folks at the Oregon Humane Society, such as Scott who helped us, Sam and Emma weren’t the only pets to find good homes over the Christmas holidays. The night before we went to the Humane Society, I browsed the online list of available cats and wrote out a list of the many names, crossing out the ones that weren’t recommended for a multiple cat household. I highlighted in yellow those I thought sounded interesting, one of which was Sam (then named Candy Cane) and one of which was Emma (then named Purrana). I’ve been browsing the recently adopted pet list at the Humane Society’s web site to see what other animals got adopted, after watching them all it was hard not to want to back up the ark to the front door and bring them all home. I’ve been happy to see so many of the cats find homes, particularly those we came close to bringing home ourselves. There was the little black kitten, Mad Max, a playful little thing who we requested first and actually got his paperwork before we changed our mind and requested Sam, and Sam was so adorable we didn’t look for any other kittens so young. I was happy to see that Mad Max got adopted later, as did his cage mate Will Smith. So did Snowflake, a lovely creature who was next on our list if we didn’t go with Emma. Isis also found a home, an energetic black kitten who we feared might be a little too aggressive. Jack Frost, a very timid all white cat that lived in the same room, also got adopted. So did Lily, another all white cat who seemed very sweet but was not recommended for multi-cat homes. Thankfully nine year old Sidney also found a home, she didn’t care for shelter life and was ill while we were there. Also adopted were Pudge and Truman Capote, who looked too much like Templeton for us to really consider. To my great surprise, Crumpet also got adopted, an occasionally irritable black cat who had been there half a year. If we didn’t already have Scout, I would have wanted to adopt Crumpet, after Templeton I have a real soft spot for cats who seem irritable in such public situations but who might be a real lovable lap cat at home. But I didn’t want to risk it with Scout, getting used to new cats in the house is going to be hard enough for her, and we think Sam and Emma will be good companions for her for years to come. So my thanks to all those who helped these animals find homes, and my best wishes that the remaining pets will soon find homes of their own. Sam’s tags have water on them in this picture, he sometimes accidentally dunks them as he goes to get a drink. This entry was posted in Pets and tagged cat, kitten, orange tabby, Sam. Bookmark the permalink. 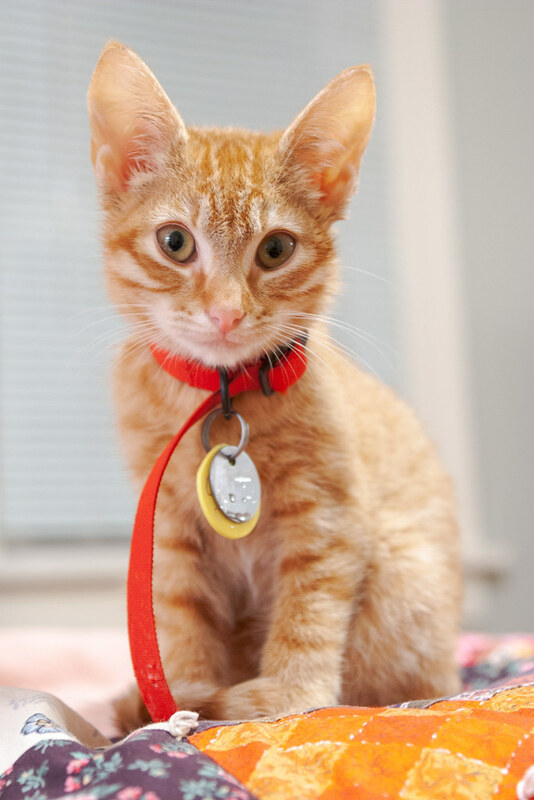 ← The Gold Medal For Cutest Kitten of 2007 Goes To … Samwise!